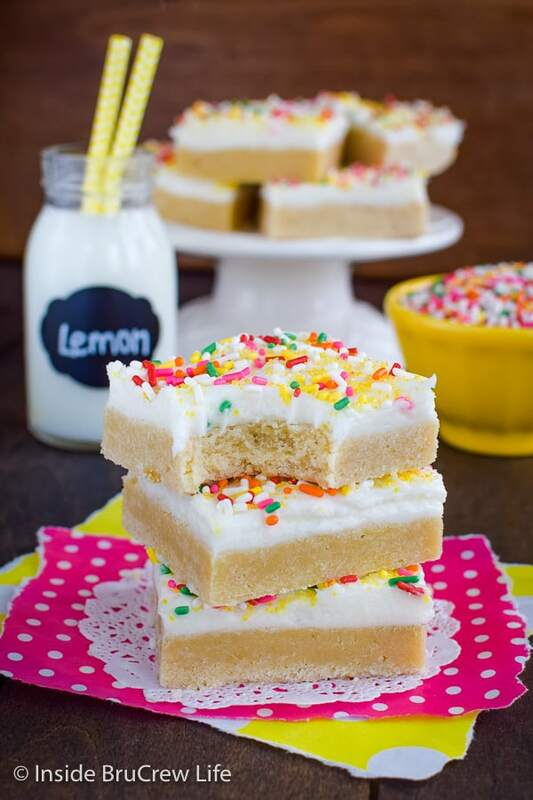 Lemon Sugar Cookie Bars topped with fluffy lemon frosting and sprinkles are a fun dessert that everyone will love. 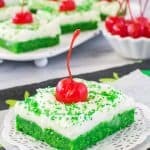 Easy treat to make for potlucks, picnics, and parties!!! Recently I started using a sugar cookie body butter and boy, does it smell amazing! Let’s just say that’s not the best idea when you are watching what you are eating and trying to stay on track with healthy food to coat yourself in cookie smelling lotions. Why? Because the smell of the lotion slathered on your body will cause you to want to gnaw your arm off, instead of eating more broccoli. Ok, maybe that’s a little drastic, but seriously, this lotion is amazing smelling stuff!! Although, I really do not recommend using it before working out. I was running one day, and I kept smelling marshmallows. It took me a while to realize that the marshmallow smell was actually coming from me. Do you know what else is pretty amazing? Being able to make and frost sugar cookies in less than an hour! Maybe one of these days I be inspired to cut out these Cinnabon Sugar Cookies again. Until I get that urge for cute shapes, I will be making sugar cookie bars in a pan every.single.time. They are so much easier and faster! Plus, they are so easy to change up and customize your flavors. 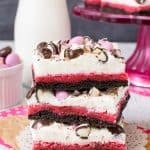 Since we are not spending time rolling out dough, cutting cookies, baking, frosting, and then cleaning up a big mess, we have time to think up new and fun cookie bar flavors. Over the years we have added different flavors to different frosted cookie bars. 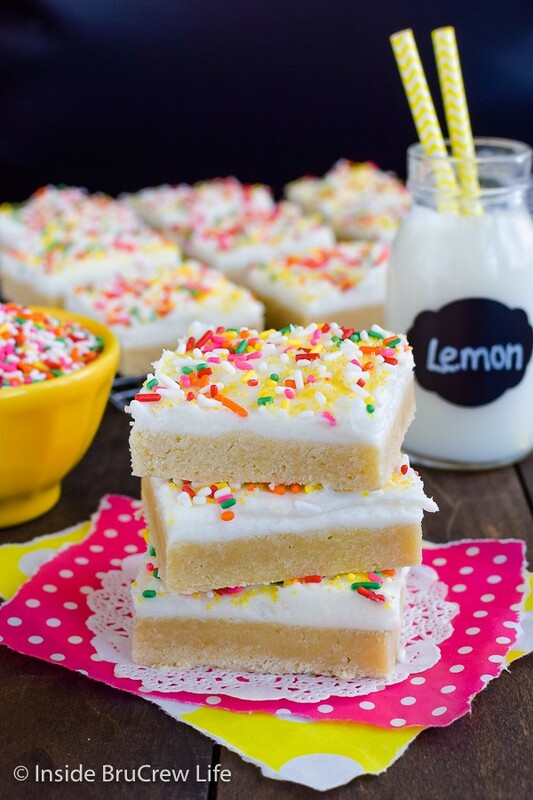 Pineapple and coconut adds a fun twist to these Pina Colada Sugar Cookie Bars! I’m a fan of s’mores all year long. 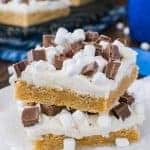 So these S’mores Sugar Cookie Bars with gooey marshmallow frosting and chocolate candy bars always make me smile. 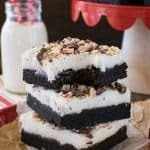 Have you thought of any other flavors that would be delicious in an easy cookie bar? 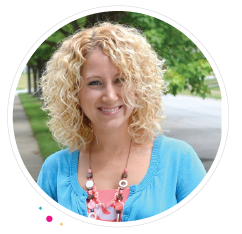 I have a few other versions here on the blog and also swirling in my head. This time I decided to make a pan of easy lemon bars using my sugar cookie method. Since The Best Lemon Bars always get rave reviews, I knew another lemon bar recipe would be a hit. Make sure to set out the butter out ahead of time, so it is soft when you start to make your cookie dough. Spray a 9×13 pan with with nonstick spray. Set aside. Beat the butter and sugars until light and creamy. Add the lemon juice and egg and beat again. Stir together the flour, baking powder, and salt and slowly mix it into the butter mixture. Spread the cookie batter into the greased pan with a spatula and bake for 14 minutes. Let them cool completely. 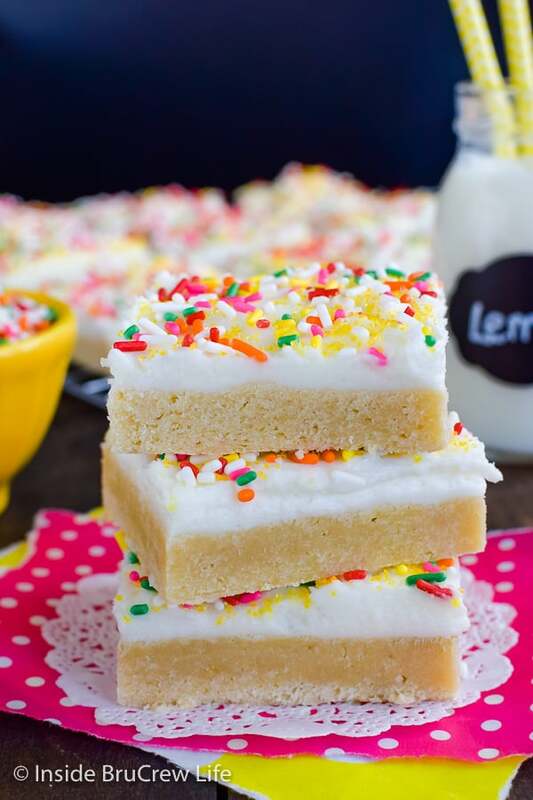 Now the lemon cookie bars are completely delicious as is, so if you are anti-frosting and sprinkles, go ahead and dig in. But if you want to add even more lemon flavor to these easy lemon cookies, I suggest a batch of this fluffy lemon frosting!!! Beat the butter, lemon juice, and salt until creamy. Slowly beat in the powdered sugar and heavy whipping cream until light and fluffy. Spread the homemade frosting on the cooled bars. Next add lots of colorful sprinkles and yellow sanding sugar to the top. Adding lemon juice to the dough and the frosting is the perfect way to add a little bit of cheery goodness to these lemon sugar cookies. Preheat the oven to 375 degrees. Spray a 9x13 pan with nonstick baking spray. Beat the butter and sugars until creamy. Add the egg and lemon juice and beat again. Stir together the flour, baking powder, and salt. Slowly mix this into the butter mixture until a soft dough forms. Spread the dough into the prepared pan. Bake for 14 minutes. Let cool completely. Beat together the frosting ingredients until creamy. Spread on the top of the cooled bars. Top with desired amount of sprinkles and sanding sugar. Cut into 24 squares. Store in a sealed container on the counter. 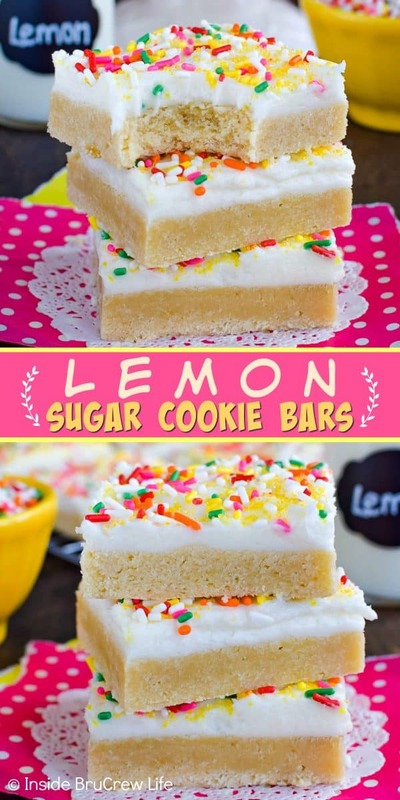 *The post for these Lemon Sugar Cookie Bars was originally published on March 27, 2015. It has been updated and republished on February 4, 2019. Jocelyn – I’m all about the bar cookie life. One pan is such an easier way to clean up. The lemon flavor matches perfectly with the sugar cookies. And frosting?! Who can say no to cookies covered in frosting? Not me! Your comment about smelling like marshmallows at the gym is hilarious. I’d totally do the same thing. I am all about the easy one pan treats these days. Less time prepping and decorating is always a win win!!! I love lemon, and putting them in these amazing cookie bars just made my happy self jump up and down. Especially with frosting! Sugar cookie body butter?! Where can I get my mitts on that?! And I LOVE making sugar cookie bars….this girl aint got no time for a rolling pin. That lemon touch is perfection for Spring munchin’! Pinned! That body butter is the bomb. Check out the link above to get it through amazon 🙂 And thank you so much for the pin love! NOW this is my kinda sugar cookie! I always say I love cookie bars because I can make a whole batch much quicker! Plus they are more forgiving they don’t all turn up the same size 😉 And sugar cookies are my weakness….. 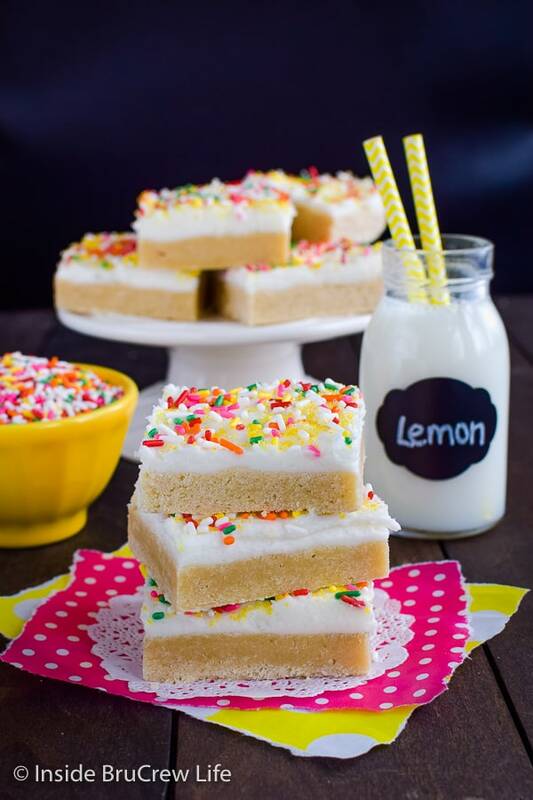 These sugar cookie bars look gorgeous, Jocelyn! Just what I need on this snowy Friday morning. Spring is on the way, right? 🙂 Pinning these cuties! This week it looks like spring is here. I hope you get some spring weather soon too! Thanks for sharing!!! I just love these cookie bars. There are sprinkles and frosting on top of a cookie. What is not to absolutely adore. Love these! I agree, bar cookies are perfect most of the time because they are just so easy! These are gorgeous. Pinning. Thank you so much Marye!!! Easy bars always win out!! These are so fun and perfect for Spring! Love!! I wonder if the lotion would have less calories? LOL Love these, obviously. Is there anything better than a lemon sugar cookie??? The best of all worlds rolled into one! 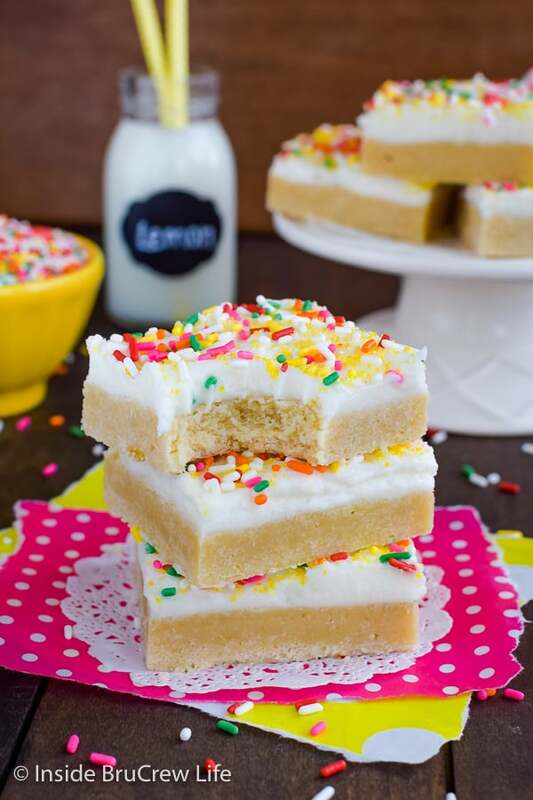 The ease of bars, the flavor of lemon, meets sugar cookies…and that frosting! I would dive right in!! These bars are definitely the best of both worlds!!! I have to admit that I dove in and didn’t look back until they were gone. So good!! 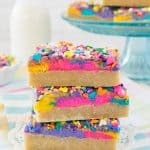 I love sugar cookie bars! The lemon is a perfect flavor for spring! Thank you so much!! It is such a perfect spring flavor!!! LOL! My husband and son watch The Walking Dead, so I hear all about those kind of things! I hope you enjoy these bars! Thanks for pinning! I LOVE the idea of a sugar cookie that doesn’t need rolling! I live in NYC and our kitchens are so small there is just no room. I am always looking for ways to avoid rolling dough! Thank you for sharing. Pinned! It was hilarious because I seriously couldn’t figure out why the gym smelled so good that day…then it hit me! These bar cookies are perfect for small kitchens. Less prep and less work always win! I’ve got a Strawberry Cheesecake lotion that smells SO GOOD but I can’t wear it because it makes me hungry! These bars look so delicious! I want to go make them now! Love this! Bar cookies are so much easier and every bit as good!!! My love for lemon desserts is never-ending! 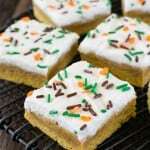 These sugar cookie bars look so soft and chewy, girl! Love them. And I also adore yummy-scented body lotions and sprays but I TOTALLY know where you’re coming from! Lol! My new favorite bars. These look perfect Jocelyn! do you think these would be good without the frosting? They wouldn’t be bad at all. Probably not as sweet though. The frosting really adds something to the cookies. Found this on pinterest and tried it for a 4th of july pot luck……..these are absolutely perfect. I would suggest chilling the dough before getting it into the pan, because I found my dough to be a bit sticky and hard to spread, but it worked out. For my batch, I reversed the amounts of milk and lemon juice in the frosting to make it a little more lemony and everyone raved about it. I’m thinking it would be really good with a cream cheese frosting, too. Gonna try that next. The sugar cookie batter is just absolutely my all time favorite type, it came out perfectly and this was such a perfect easy desert. Thanks! Yay! I’m glad to hear that you loved the cookie bars. A tip for spreading the dough in the pan is to spray your hands with non-stick baking spray. It keeps the dough from sticking to you….but chilling works too! Love that you added more lemon to the frosting too!!! 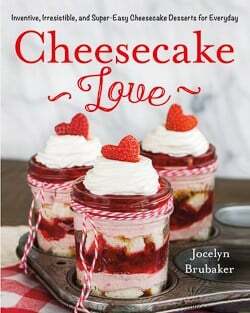 And I think cream cheese frosting sounds amazing! Lemon bars are the best! Love the idea of adding a little lemon juice to the frosting! 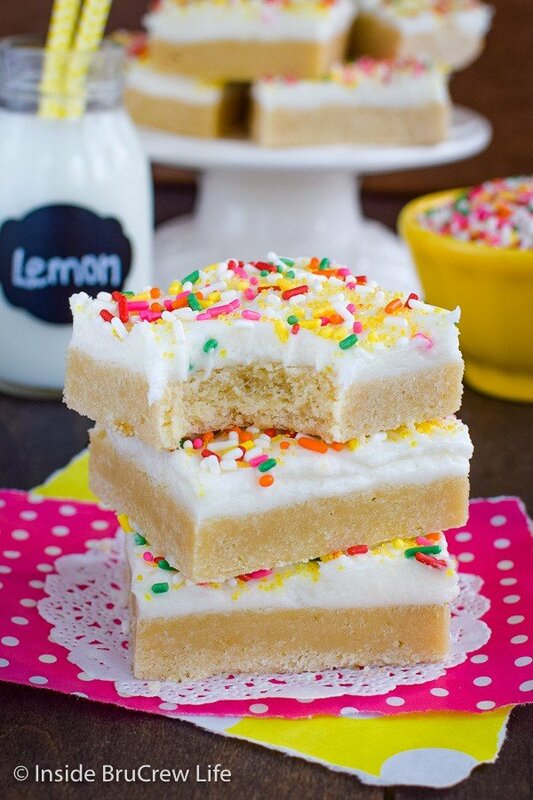 Sugar cookie bars are the best & I bet the hint of lemon makes them even tastier! Can’t wait to try them out!! I’ve been craving warmer weather and Spring, so I decided a lemon dessert was needed to lift my mood! This was such a good recipe and my entire family enjoyed it! Thank you! I always use all purpose flour unless the recipe says something different. Congrats on getting into baking. I hope you have fun with it!! !